APPLICATIONS ARE NOW OPEN FOR THE NEXT ROUND OF AWARDS. SUBMISSIONS WILL BE OPEN UNTIL 15TH AUGUST 2011. These awards are open to emerging and established filmmakers working anywhere in the world. We welcome one-off, creative documentary ideas of any length and subject, in any style and form, but we are particularly keen on ideas that speak to PUMA.Vision’s core values of Safe, Peace and Creative. The current call for applications is now open until August 22nd 2011, with the awardees due to be announced in October 2011. Please join our mailing list and keep checking on the website for the next open call of 2011. 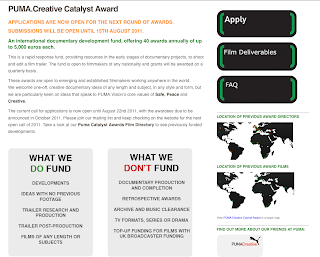 Take a look at our Puma Catalyst Awards Film Directory to see previously funded developments.